Radiation therapy saved my life- but it damaged my heart. Radiation therapy saved my life- but it threatened to leave me infertile. Radiation therapy saved my life, and it has given me LIFE – a life full of Faith, Grace and Hope. Three years ago, I celebrated another Hodgkin's Anniversary. 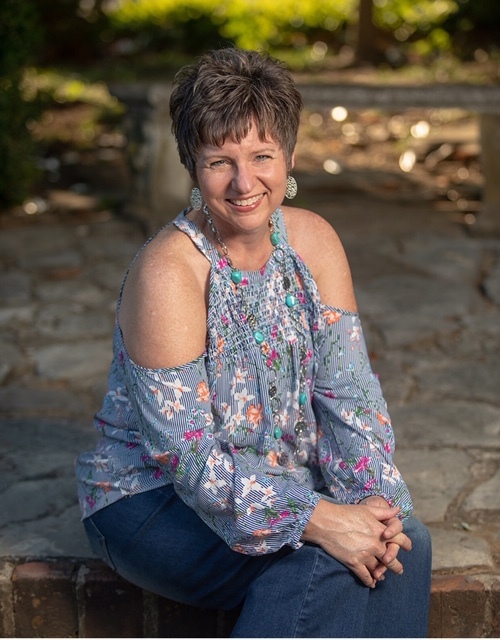 Though I had never met another survivor in my many years of survivorship, I had some questions about some minor health issues. My doctors couldn’t answer my questions with a valid answer- at least enough to satisfy my curiosity. So I hopped on Facebook and began a search for anything "Hodgkin's". I found "Hodgkin's International" and the Facebook group, "Long Term Effects Survivors". The dialogue and answers I had been seeking for so many years had been found. I have spent thirty-one years on a journey and I finally discovered I was not alone. On Halloween of 1987, I was driving home from my full-time job. My neck was itchy, so I reached up to scratch an egg-sized lump on the right side of my neck. "What is THAT?" I wondered. When I arrived home I asked my mom, a licensed Registered Nurse, to feel the lump. She turned white. That next Monday morning, bright and early, I was examined by our family doctor. We sat in the waiting room awaiting the x-ray results. He brought the x-ray film right out into the waiting room (clearly before patient privacy mattered!) and held it under a light. My chest cavity was white - meaning FULL of disease. Within two hours, I was laying on a table undergoing a biopsy. If it were not for my parents, I would have disappeared into a cave, never to come out again. I was twenty years old. The "local" biopsy was not successful. Two weeks later, I went into surgery for a more precise biopsy. The phone rang a few days later to let my parents know that my diagnosis was Hodgkin's Disease – the “good kind, not the bad kind” is what the doctor said, the one they could cure you from. After the Christmas holiday ended, I found myself lying on a cold, steel table. They were readying me for radiation therapy- painting my face, chest and abdomen with cold, wet, reddish-purple paint. The paint was a road map, telling the technicians where to place the steel blocks that would keep radiation beams from penetrating vital organs. I was told I couldn’t wash it off for a long while. I looked like a warrior going into battle, and I WAS starting a battle- to undergo mantle and abdominal radiation treatments to rid me of the Stage 2A cancer that was attacking my body. (Those steel blocks should have been stacked ten feet high). I was twenty years old. I would be turning twenty-one in just a few months, in March of 1988. I hated my life. I had no self-confidence. I was depressed. My friends were off going to parties, concerts and enjoying their college lives or their new jobs. And, while everyone tried to invite me to their gatherings, I had to turn down each one because I was too sick with the cancer to leave my home. I celebrated my 21stbirthday staring at the birthday cake that my mom and dad bought me. They tried so hard to make it special for me. I didn’t care. I just wanted to be normal again. I went through three months and four days of brutal radiation treatments. The hospital was only five minutes from our house. I absolutely HATED going into the cold, dark room where the radiation machine was waiting. The technicians didn’t seem to waste much time feeling sorry for me. It was just, "Lights… camera…ACTION!" I lost half of my hair. I slept all the time. I could not eat. There were weeks that I developed "radiation poisoning" as the rays were adjusted to what my body could stand. And my skin was burned. Through all this, I truly had no idea of the magnitude of it all. There were no support groups, no Facebook groups, no websites. I just remember the pain in my parents' eyes as I suffered through severe nausea and weight loss. I don’t even remember the last day of treatment. There was no celebration, no bell to ring. You just left the building- on your own. For me, it was only a bad dream to escape. And I did escape, cured of the cancer. It had been literally burned up. No more remained. In the following years, I just tried to live my life. I have no idea how I managed "emotionally". Looking back, I know I never dealt with the fact that I was battling cancer. Life just went on. The only two after-effects I suffered from were extreme fatigue and tachycardia. I married five years later and became pregnant in 1997. I informed my new radiation oncology doctor (my original doctor had moved to New York to practice) and she hugged me. She told me I was not supposed to become pregnant – that the radiation should have left me infertile. WOW ! I gave birth to two boys. I lived my life healthy and full of energy. Never looking back. FAITH. Our eldest son, during his junior year of high school, was a track and field standout on the high school team. He threw discus from a powerful right arm. He was even offered a spot on a local college track team. He worked hard to get ready for his first track meet, enduring intense weight lifting in training. Right before he was to have his first throw in the meet, he had severe pain in his shoulder. He threw the rock anyway. He went down, and stayed down, in too much pain to get up. He ended up missing several days of school that spring, unable to maneuver his arm and suffering from unrelenting pain. After long months of misdiagnosis and treatments with a chiropractor, our orthopedic doctor had a revelation only God could give him. A week later, we were in the office of a pediatric orthopedic cancer specialist. We were initially told it was a benign growth inside the shoulder and could be lasered out in a short surgery. Once inside the shoulder for a biopsy, however, the pathologist stopped the procedure and said the cells looked “angry.” They could not take a chance of lasering the growth, as they were not confident of its origin. We waited eight days. The biopsy confirmed our worst fear – cancer. I was reliving my diagnosis all over again. But this time it was worse because it was our son. He had Stage 1 B Cell Non-Hodgkin lymphoma lodged in his right shoulder. Naturally, my worst fear was that I was responsible – that he got it from me. "Not true," said our oncologist. 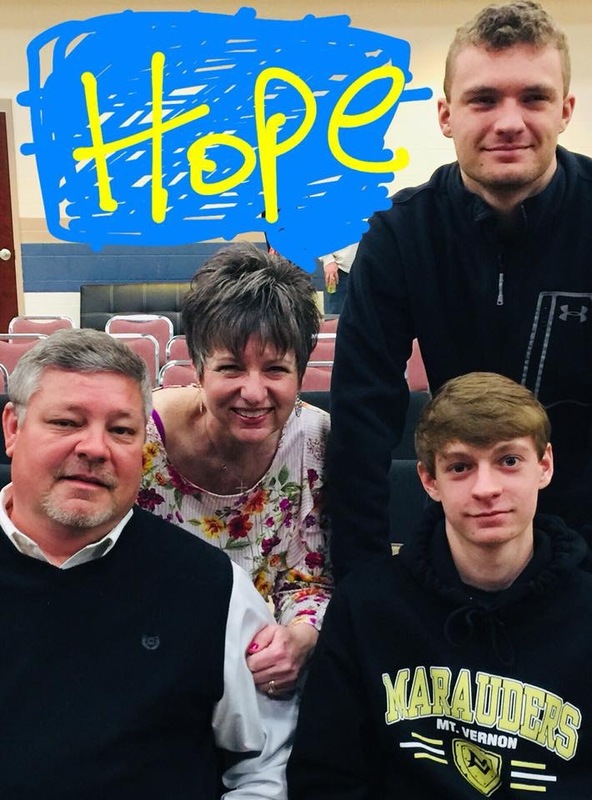 Within two weeks of the diagnosis, we were setting up online classes with the principal, celebrating his eighteenth birthday, and beginning six chemotherapy treatments. On a hot summer evening after his first chemo, I stood on our back porch and tearfully shaved my eldest son's blonde curly locks. His hair was already beginning to fall out. As hard as it was to do, it was my way of acknowledging the common bond that we now shared- unwanted, yes, but it no longer mattered. We would fight this together. That December, he was declared in remission. He has since gone on to use that shoulder to its fullest – participating in white water kayaking and mountain climbing with "First Descents", a non-profit organization for young adults ages 18-39 that provides outdoor adventure for cancer patients. (If you are curious about this organization, please feel free to email me). We all wonder why we had Hodgkin's, and maybe we will never know. But this much I do know: I think I had to have cancer first so that I could get my son through his own diagnosis. GRACE. Three months after my son was pronounced "cured", I went for my annual OB/GYN appointment. My doctor listened to my heart as part of the exam. Her face turned white and she backed away. She told me I had a very loud heart murmur. She was concerned and instructed me to see my family doctor the next day. I followed her advice and went to the cardiologist's office for an examination and testing. I was told I had "severe aortic stenosis", no doubt caused from mantle radiation. The radiation that saved my life had damaged my heart and had calcified a major artery. The doctor said that I had less than six months to live. "How does this happen"? I thought to myself. We had just been through hell with our son. Now this. I tried to negotiate with the doctors – after all, we just finished the worst part of our lives and my son was a senior getting ready to graduate, and our youngest son was getting ready to start his travel soccer season. I didn’t have time for open-heart surgery and recovery. The cardiologist said that if I ever wanted to see my son play soccer again, that I would have the surgery right away. I told the heart surgeon on my 50th birthday, “Just promise me I will be at my son’s graduation". He said, "I will get you there". My husband and I left his office in shock. The next stop before getting home would be to buy me a birthday cake from my favorite German restaurant. After all, might as well drown the shock with chocolate and icing! FAITH OVER FEAR. I had open-heart surgery on March 22, 2017 in my hometown of Indianapolis. The trauma from surgery caused large amounts of fluid to take up permanent residence in my lungs. As a matter of fact, it's such a hospitable place for the fluid that it refuses to leave! After several thoracentesis procedures I was given a diagnosis of "trapped lung". There is a surgery to reverse the condition, but I choose not to undergo the surgery. The reality is that my lungs are permanently damaged from the mantle radiation. (Which is EACTLY why they needed to protect my lungs with STACKS of steel blocks rather than just two)! I am currently stable - living with fluid in my lungs that is controlled with Lasix. I've found that keeping active is the best treatment. Not going backwards, just looking forward is my goal. HOPE. Through all this, I feel like I am now walking out a cave. The cancer events have left me with minor PTSD but also with a new realization that life is fragile, that things that seemed so important two years ago now seem trivial. You can’t explain all this to another person who has not been through these experiences. They just don’t understand. I am content to stay in the presence of my family, my close friends and others who have been on this journey with my family and me. I feel everything is a moment now, and I want to live with urgency. I have to remind myself to slow down and take one day at a time because the urgency moves faster than my body will allow. I found Hodgkin's International about three years ago. I also found Facebook support groups for long- term survivors of Hodgkin's Lymphoma. I read about what others like me were going through. I got as much information as I could. I thought the heart valve symptoms would never happen to me. I started posting on these sites after I was diagnosed with the aortic valve issue. Such support came my way! I am forever thankful for these groups of survivors that walk alongside me. I hope to meet you someday. I hope to meet other survivors in my local area. I hope to be a voice in the medical community. I always wonder if other Hodgkin's Lymphoma patients came through the same hospital that I did, needing the same surgery I did. I wonder if they are alone, not knowing that there are others out there who could help. We truly are a unique community of survivors. HOPE. I close this article with encouragement. You can choose to live your life in fear thinking all the late effect symptoms will come to you. But don’t live in fear. Our son is two years in remission now, doing amazing things with his life. I am 31 years in remission this April. I feel pretty good. I’m not the same – mentally or physically. I am continuing to become familiar with the new person that I have become because of cancer. Please embrace your life and what God has given you. I’m overwhelmed by God’s grace. Be unshaken and move forward. Choose Faith over Fear. FAITH, GRACE and HOPE! Who Will Love This Broken Body?